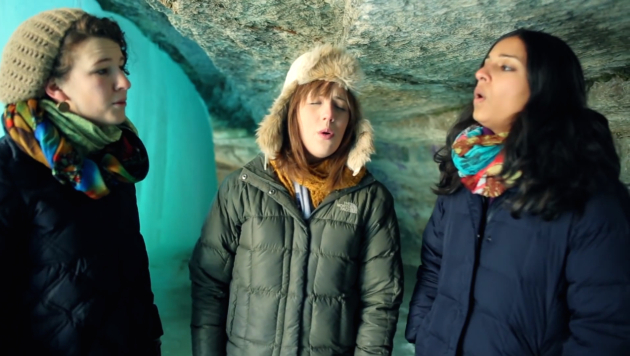 Sarah Larsson of Minneapolis, Rachel LaViola and Nila Bala (left to right), a.k.a the Nightingale Trio, sang last January behind frozen Minnehaha Falls. They may hail from three far-flung corners of the country, but the Nightingale Trio, three songbirds specializing in Eastern-European folk music , still make time to unite for several weekend concert tours a year, and are bringing four to the Twin Cities area this weekend. Sarah Larsson of Minneapolis, Nila Bala of Baltimore and Rachel LaViola of Dallas met when they sang with a Slavic women’s chorus at Yale, where in 2012 they earned degrees in anthropology, law and film respectively. Last January, the trio, aged between 24 and 27, performed on “A Prairie Home Companion” as well as behind a frozen waterfall at Minnehaha Falls, which you can watch on their website. They will perform 8 p.m. today at the Verdant Tea Tasting Room (2111 E. Franklin Ave, Minneapolis), 6 p.m. Sat. at the Eat for Equity Festival on Lily Springs Farm (1930 6th Ave., Osceola, Wis.), 10 a.m. Sun. at Wayzata Community Church (125 Wayzata Blvd. E., Wayzata) as part of a worship service, and 2 p.m. Sun. at the art gallery in Hennepin Avenue United Methodist Church (511 Groveland Av., Minneapolis). The concerts are free with goodwill donations suggested.